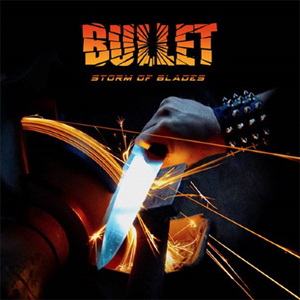 Swedish rockers BULLET have revealed details of their upcoming album, Storm Of Blades, which is due out on September 5th (September 3rd in Sweden, September 8th in the UK, September 9th in North America) via Nuclear Blast. It is their fifth full length release and the first featuring new guitarist Alexander Lyrbo, who replaced Erik Almström in 2012. “This is a fast and heavy back to the roots album,” the band comments. "A lot of the feeling, BULLET had in the beginning, is there but with a up-to-date sound and craftsmanship. Now with the young blood Alex on the guitar, always thirsty for metal, the songs ended up just like that: Heavier, faster and more raw than on previous albums. We can now at last truthfully say; this is our best album this far and most likely the rawest since the Heavy Metal Highway recording in 2002." The album title, Storm Of Blades, came up during a soundcheck before a show last year. Right after some summer festivals and the album release, BULLET will be on the road again, along with two well-chosen support bands.